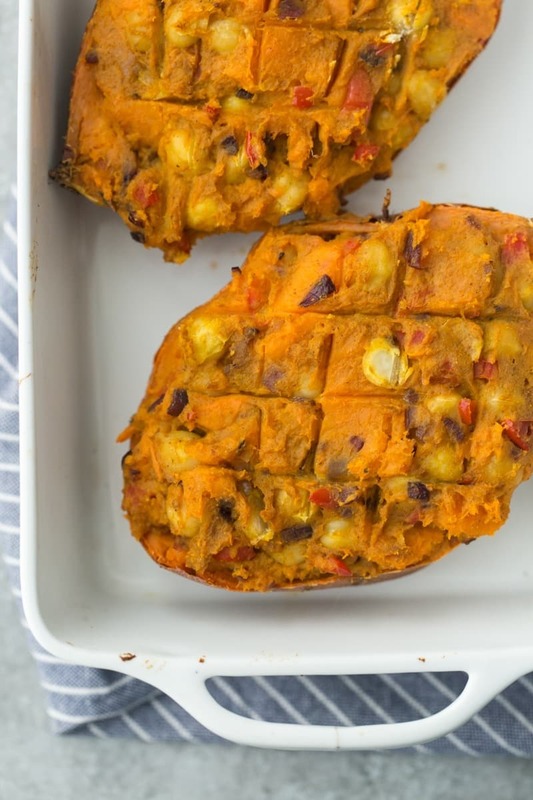 Curried Twice-Baked Sweet Potato | Naturally. 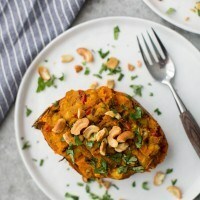 I only feel slightly bad that it’s only the middle of October and I’ve already shared a handful of sweet potato recipes. I’ve embraced fall full force even though Northern California is downright hot right now. This is an updated version of an older recipe on the site but it’s one that sees a regular rotation in our house. I’ll actually bake the sweet potatoes ahead of time, usually on Sunday. That way you only have to cook the vegetables and assemble everything on the weeknight. Before I dig in to the recipe, I really recommend washing the sweet potato and plan to eat the skins. It makes for such an easier way to eat this, there’s no food waste, and adds more nutrition to the overall meal. I also eat potato skins, rarely peel beets or carrots, and recently shown my love of winter squash I don’t have to peel. I don’t have a huge field of variations for you on this recipe, but there are a few that I occasionally work into my rotation. Cheese: I’ve been living on the side of less cheese recently (crazy, I know) which is why this twice baked sweet potato stayed vegan. However, the addition of feta or goat cheese is really nice and helps to balance the spice of the curry. 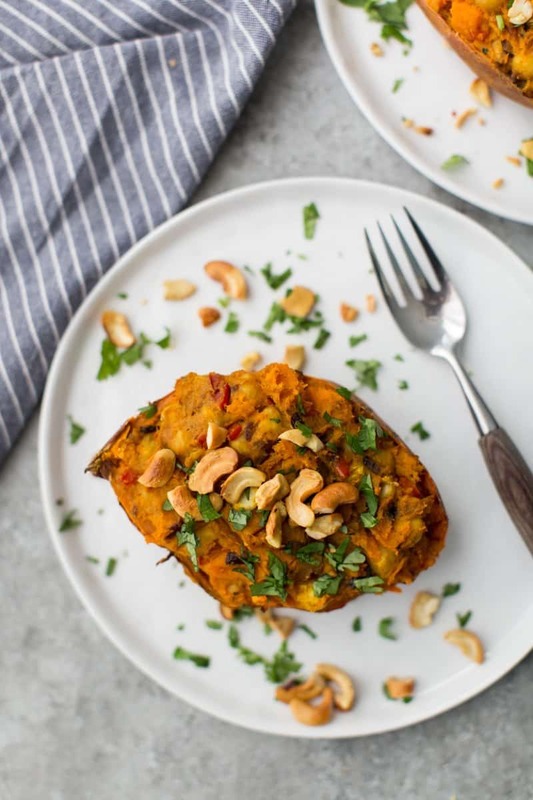 Change the medium: This recipe is all about sweet potatoes for me but I’ve also used butternut squash and regular baked potatoes before. Preheat oven to 400˚. Scrub sweet potato well and pierce a few times with a fork. Place directly on the oven rack with a sheet tray on the rack under (to catch any sweet potato run-off) Bake until sweet potato is tender, 45 to 60 minutes. Remove from oven and let cool enough to handle. Heat a skillet over medium heat. Add oil, followed by onions and peppers. Cook until onions are soft. Stir in garlic and cook for another minute more. 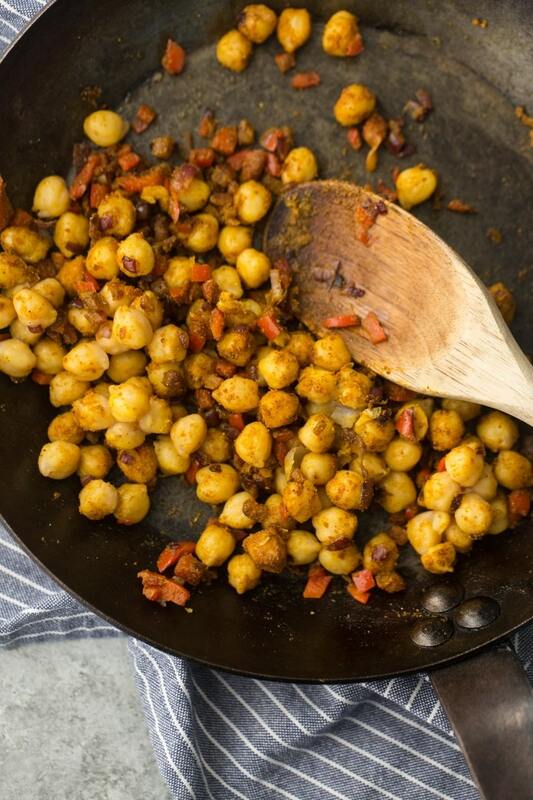 Stir in garlic, cook for a minute then add in the chickpeas and curry powder. Stir and cook just to heat the chickpeas. Turn off heat. 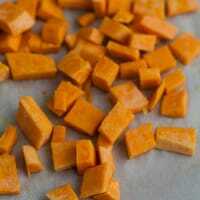 Cut sweet potatoes in half and carefully scoop out the insides into a bowl leaving ¼” of sweet potato with the skin. Mash sweet potatoes with the coconut milk and pinch of salt. Fold in the chickpea mixture until well combined. Scoop the filling back into the skins. Smooth the sweet potato tops and score with a criss-cross design. Place on a baking tray or in a roasting pan. Bake for another 15-20 minutes or until mixture is heated through. Top with minced cilantro and toasted cashews before serving. + If you want to move this meal along, try cooking the sweet potatoes ahead of time. This looks so full of flavor. Can’t wait to try it! A great way to spice up one of my favorites. This looks so flavourful and tasty! Hmm.. oh yes! 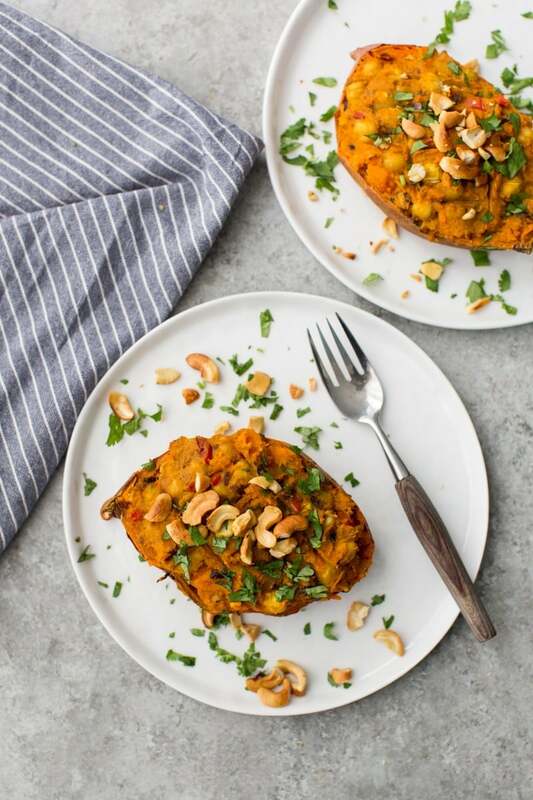 Twice baked sweet potatoes are the way to go 😉 especially since we had the first snow here in Europe this week and something quick and warming is all you need after a long day at Uni… Love the idea of a chickpea-curry-combo! These sound awesome! I love sweet potatoes, but I get bored making my old stand-bys over and over. This looks perfect for spicing things up! I love stuff like this – perfect for dinner and then for leftover lunches! Yum! I’m all about sweet potato skins too. That’s the best part, in my opinion! How could this NOT be amazing? Yum! The one downside of reading all these northern hemisphere blogs from over here in Australia is that all these great fall recipes are all over the interwebs, yet here I am wearing shorts and eating watermelon (don’t get me wrong, I’m not complaining). Nonetheless, this one is definitely being bookmarked for next year. Sweet potato? tick. Chickpeas? tick. Roasted cashews? Um, yes please. I love sweet potatoes. These twice baked potatoes look amazing. Sounds yummy! Have saved the post to give it a try soon. Looks delicious! One of our regular dinners is your baked sweet potatoes with teriyaki chickpeas. Yum! Will try this one soon. Liked this so much that right after finishing the first batch, I made a double batch. The only substitution I made was skim milk in place of coconut milk, which I didn’t have. I even froze two of them to save and take for lunches at work – worked out great!